It’s ALL about quick and easy recipes, especially during the busy work week. And it truly doesn’t get much easier (or tastier!) than these recipes! Make-ahead meals are the key to happiness (and sanity)! I mean you can literally just dump all of your ingredients into one single dish and throw it in the oven or slow cooker. It’s that easy! 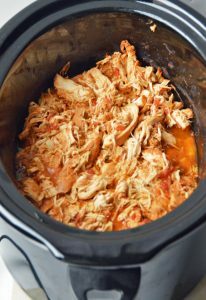 One of my go to meals during the week is Slow Cooked Mexican Chicken. I think we can all agree Mexican food is delicious, but often it is not good for our waistlines. By making this recipe, you can save money and calories. It really makes for GREAT meal prep, too. I like to make a batch, keep in the fridge, and then make taco salads or burrito bowls throughout the week. Not to mention, you can toss it in your slow cooker in the morning before leaving for work and it is ready when you get home! It is just that versatile. Place the cover on top and cook on low for about 7-8 hours or high for about 5 hours. After its cooked all day, take the chicken out and shred it. Mix in a Taco Seasoning packet or try it with a Ranch Dressing seasoning packet. Put the lid back on for about another 20-30 minutes to let the flavors blend. Looking to make it even healthier… Trade out the taco/tortilla shells for lettuce. Bibb lettuce is my favorite – it makes a great, low calorie, healthy and tasty wrap. Use brown rice instead of white rice, or try using quinoa as your base. Lighten up your bowl even more by skipping the cheese and swapping sour cream for a dollop of Greek yogurt. This is one of those simple, staple recipes you can return to week after week. Here’s another healthy meal that is super filling and packed with fiber and protein, despite being a meatless dish. 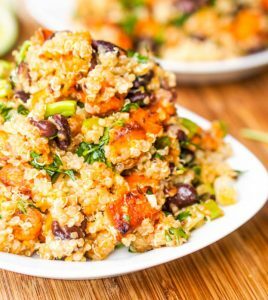 Quinoa and black beans provide added protein in this meatless casserole, so you won’t be hungry an hour after dinner. If you aren’t vegan or on dairy-free diet, feel free to throw in some shredded chicken, ground beef or turkey, along with some shredded cheese. Serve it up on taco night! Combine all ingredients, except for the green onions, in a 9×13 baking dish sprayed with cooking spray. Cover with tin foil and bake for 45 minutes. Remove tin foil and continue baking for an additional 15 to 20 minutes until the liquid is mostly absorbed and the sweet potatoes are tender. Remove from oven and let the casserole sit for 5 minutes so that any remaining liquid can be fully absorbed. Sprinkle with green onions. Serve and enjoy! NOTE: If it looks like there is still some liquid in the casserole after baking for an hour, it’s okay! It will absorb perfectly after sitting out for a few minutes before serving! TIPS: This is definitely one of those dishes you can easily change up by substituting other veggies that you prefer, such as chopped bell peppers, zucchini or squash. You can also try switching up the seasonings. The leftovers make a delicious breakfast, too! Just add a fried egg and some avocado slices.